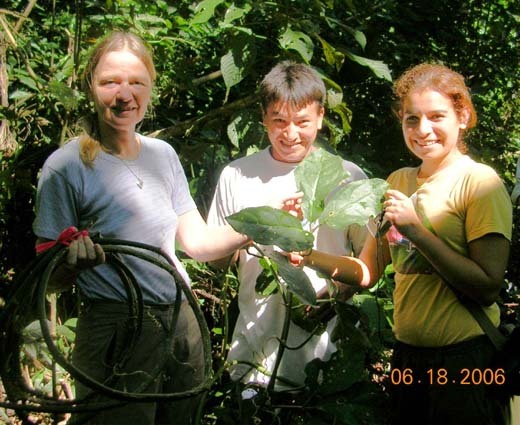 Leslie Adams (Ithaca College: Biology '05): Research on Blepharoneura and Cucurbits including molecular work and field collection, rearing, and observation at Jatun Sacha Biological Station in Napo, Ecuador 2005. Kori Ault (Cornell College: Biology '07): Research on Blepharoneura including developing Science in Action and this web site. 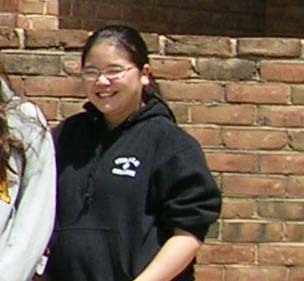 She also attended the Evolution Meetings 2006 in Stony Brook, NY. 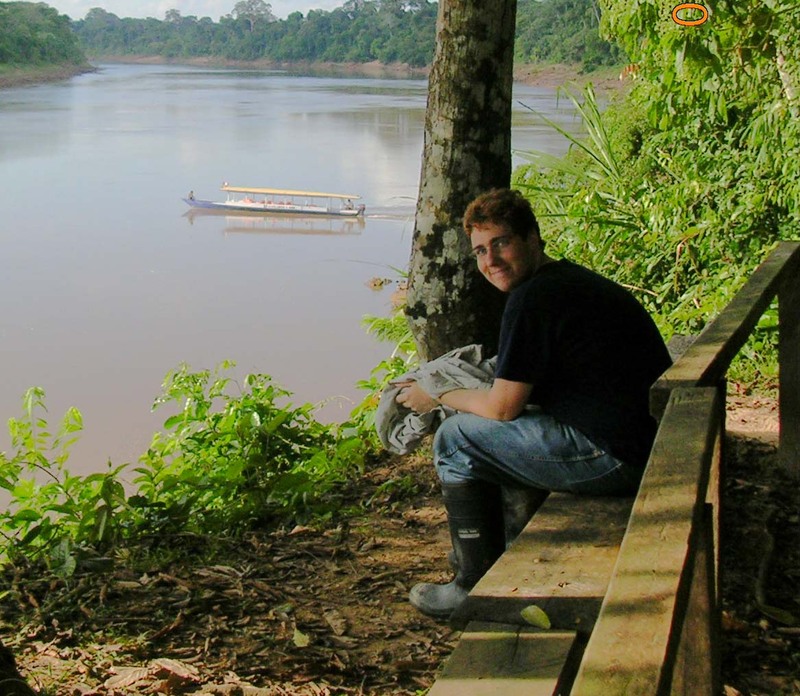 Heather Axen (Cornell College: Biology, Biochemistry & Molecular Biology '06): Research on Blepharoneura and Strauzia including molecular work and field collection, rearing, and observation at Jatun Sacha Biological Station in Napo, Ecuador 2005. She also presented a poster at the Evolution Meetings 2006 in Stony Brook, NY. Darrin Bann (Ithaca College: Biology '06): Research on Blepharoneura including molecular work and morphometrics. 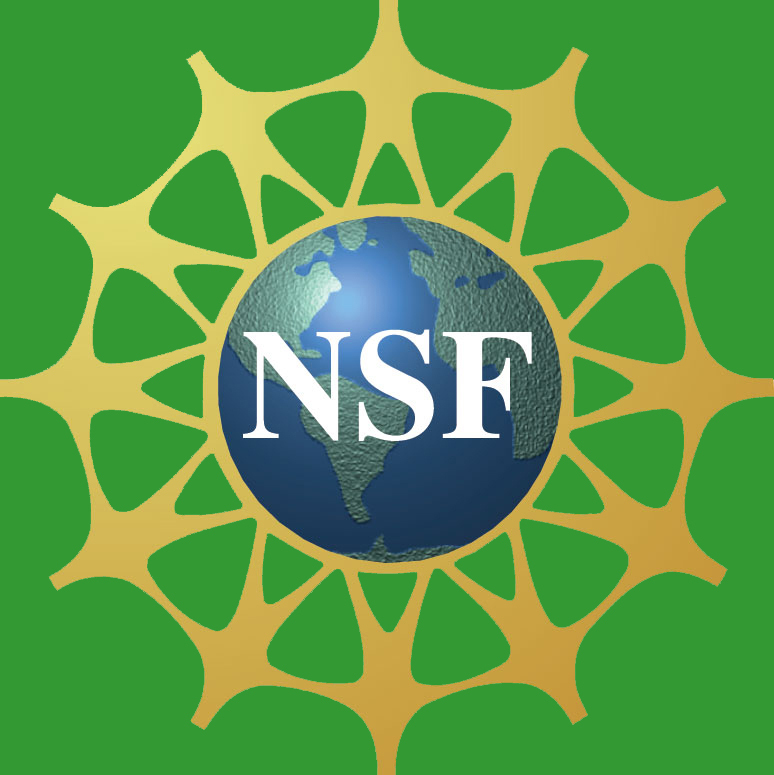 He also presented at the Evolution Meetings 2005 in Fairbanks and at the Eastern Colleges Science Conference, Conneticut 2005. 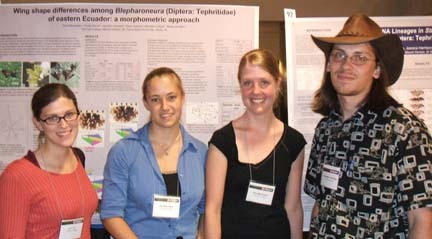 Kacie Flaherty (Cornell College: Biochemistry & Molecular Biology '05): Research on Blepharoneura including molecular work. She attended the Research Symposium Summer 2004: Systematic Entomology Laboratory. 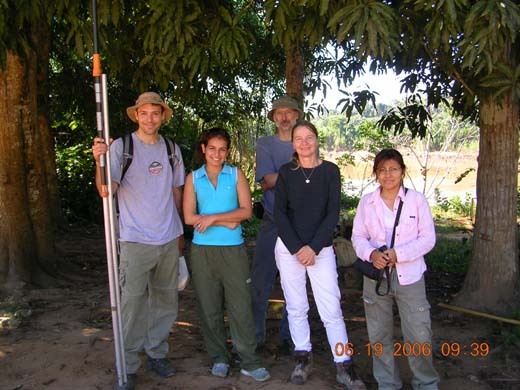 John Gammons (Cornell College: Biochemistry & Molecular Biology, Environmental Studies '08): Research on Blepharoneura including behavioral studies and field collection, rearing, and observation at Jatun Sacha Biological Station in Napo, Ecuador 2005. He also presented at Cornell College Student Symposium 2005. 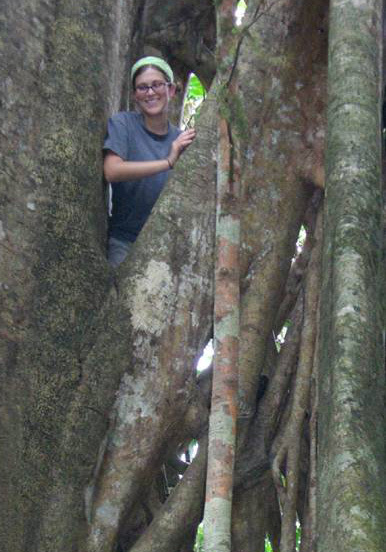 Jessica Harrison (Cornell College: Biology, Anthropology '05): Research on Blepharoneura and Strauzia including molecular and morphology work and field collection, rearing, and observation at Jatun Sacha Biological Station in Napo, Ecuador 2005. She also presented at Cornell College Student Symposium 2005. 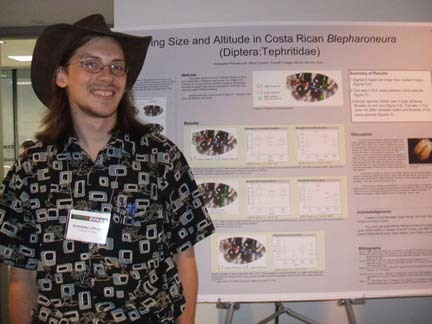 Kevin Houck (Cornell College: Psychology '09): Research on Blepharoneura including behavioral studies, rearing, and field work at Exploror's Inn, Perú 2006. Jessica Johnson (Cornell College: Mathematics, Biomechanics '07): Research on Blepharoneura including molecular work, morphometrics, and field collection, rearing, and observation at Jatun Sacha Biological Station in Napo, Ecuador 2005. She also presented at Cornell College Student Symposium 2005. Soo Mee Kim (Ithaca College: Sociology ’06): Research on Cucurbits including molecular work. She presented at USDA 2004 and attended the Research Symposium Summer 2004: Systematic Entomology Laboratory. 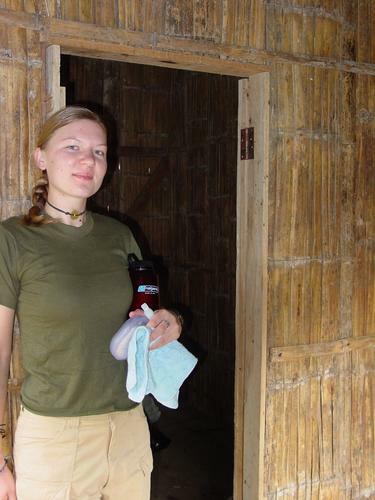 Sara Marsteller (Cornell College: Biology '07): Research on Blepharoneura including molecular work, morphometrics, and field collection, rearing, and observation at Jatun Sacha Biological Station in Napo, Ecuador 2005. 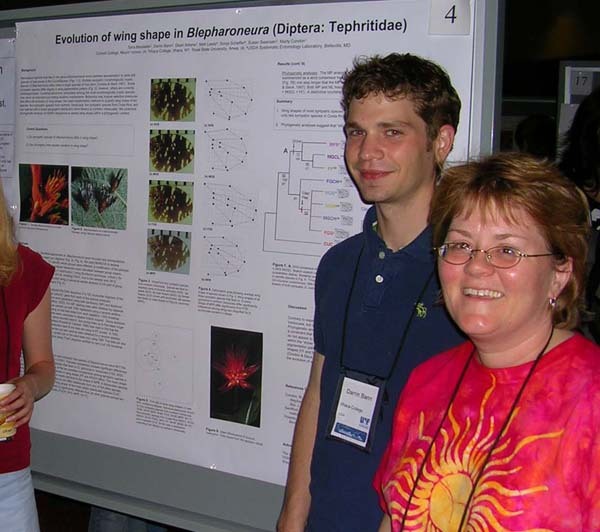 She presented posters at the Evolution Meetings 2005 in Fairbanks and the Evolution Meetings 2006 in Stony Brook, NY. Sara presented at Cornell College Student Symposium 2005 and 2006. Matt Nolte (Cornell College: Philosophy '07): Research on Blepharoneura including field collection, rearing, and observation at Jatun Sacha Biological Station in Napo, Ecuador 2005 and at Exploror's Inn, Perú 2005. 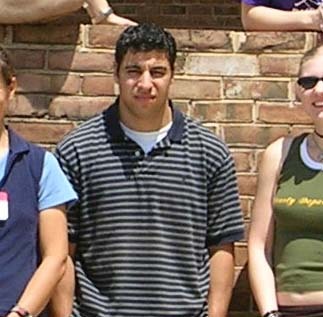 He also attended the Research Symposium Summer 2004: Systematic Entomology Laboratory and presented at Cornell College Student Symposium 2005. Robin Rakobitsch (Ithaca College: Biology '05): Research on Cucurbits including molecular work. Research was presented at USDA 2004 and the Research Symposium Summer 2004: Systematic Entomology Laboratory. Kris Rhodes (Cornell College: Geology '08) Research on Blepharoneura including morphometric work. He also presented a poster at the Evolution Meetings 2006 in Stony Brook, NY. Anthony Santoriello (Ithaca College, Biology '05): Research on Blepharoneura including field collection, rearing, and observation at Jatun Sacha Biological Station in Napo, Ecuador 2005. Frank Serna (Cornell College: Computer Sciences, Mathematics, Biochemistry & Molecular Biology '06): Research on Blepharoneura including molecular work. He also presented posters at the Evolution Meetings 2005 in Fairbanks and at Cornell Student Symposium 2005 &2006. Frank attented the Research Symposium Summer 2004: Systematic Entomology Laboratory. Fred Soliman (Ithaca College: Biology ’05): Research on Cucurbits including molecular work. His research was presented at both USDA 2004 and Ithaca College 2004 and he attended the Research Symposium Summer 2004: Systematic Entomology Laboratory. Kori Ault, Heather Axen, Sara Marsteller, Kris Rhodes at the Evolution Meetings 2006 in New York.